An easter egg is a hidden message or an in-joke, intentionally added by the game's creators. They have been around in video games since 1980 and the Sega Master System is no exception when it comes to having games with them included. Below is a list of known easter eggs for various games. If there's any we've missed, feel free to let us know and contribute over on the forum. 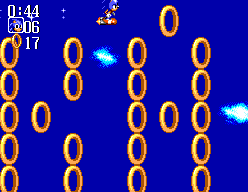 On every level during the air sections, there is a hidden area that if you bomb twice, will show a secret animation and play the Sega jingle. There is also a secret space shuttle and fish animation. Check out the Action Fighter Guide for details. When you complete the game, you will see Alex playing an arcade version of Out Run. In the castle, if you go to the attic and use the ladder and cloth to clean the sign, you will see a "Sega is No. 1" message. At the beginning of the Mt. Kave level, you will see a group of blocks in the shape of the number 7. A reference to it being the 7th level perhaps? In the Radaxian Castle, you will see a group of blocks in the shape of the letters "TA". What does this stand for? Team Alex perhaps? The orb container for the second level is none other than Opa Opa. 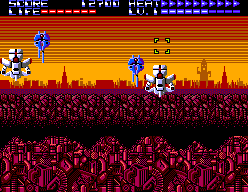 On the first level, if you shoot a certain building in the background a robot man will appear. There's one around halfway though the level and one right at the end. In the Half-Pipe event, every so often after you fail an attempt, an earthquake will occur and the second 'L' in the Hollywood sign in the background will fall down. Did you know you can hit George the Seagull in the foot bag event for extra points? Also, in the surfing event you may get a random animation of a dolphin, shark or bird when you wipe out. On rounds 1 and 4, shoot 10 Space Mines and Superman will appear. On rounds 2 and 5, shoot the Radio Towers on the boats and Jaws will come out of the water. On round 4, for every 16 hostages you rescue, with none being killed, E.T. will appear. On rounds 3 and 6, enter the caves backwards and the fireballs can't kill you. Using a cheat code, you can turn the main Daffy sprite in the Fergus Head. In round 3, look closely and you will see Alex Kidd's face blended into the background of the red cave wall. At the level select screen, you can see Opa Opa, Teddy Boy, Alex Kidd and the knight from Pit Pot. Did you know that the gentleman behind the shop counter is game programmer Scott Marshall? 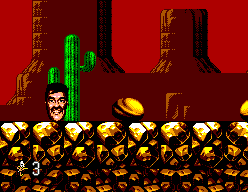 In Sky High Zone Act 1, you will find an extra life in the top-left section of the level. Walk into the box from the left side and 2 birds will appear. Hidden in the game is a collectable Game Gear which gives you access to a Pac-man mini-game. 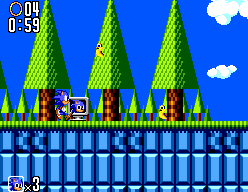 On level 3 ("Downtown") you can see posters of Sonic and Opa Opa on the walls in the background. Throughout the game you will notice cameos from Opa Opa. Inputting various passwords will display secret messages. In the first version of the game, inputting a code will display a credits screen and messages from the programmers. Inputting various names at the high score screen will display secret messages. Inputting various passwords will display secret messages. In the Japanese version of the game (Gokuaku Doumei Dump Matsumoto) you can input a code at the title screen which displays a secret message. It translates as "Hey, it's true!" Achieve 7 top scores and use the initials ERI for each one, filling the table. It will display a secret message with an address, where you can send a letter and SEGA would reply. 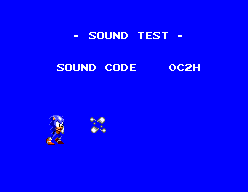 Trying the cheat code which previously worked in the original Space Harrier will display a message. Using the password 'MARIO' will display a humourous message and give you a level select. If you input the 'suicide' or 'explode' commands in certain rooms, you get a variety of secret messages.